A perfect thank you gift or just because. Pack up your blanket; it’s time for a picnic! Everything you need for a memorable outdoor excursion is included in this well-stocked basket. 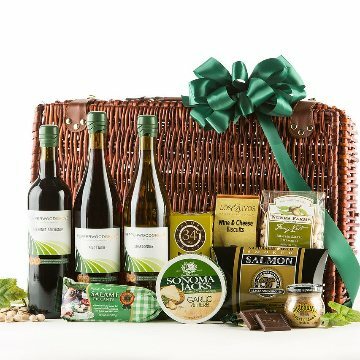 Enjoy bottles of Cabernet Sauvignon, Pinot Grigio and Pinot Noir along with smoked salmon, gourmet crackers, stone-ground mustard, truffles and more. Due to laws and regulations, this gift cannot ship to the following states: Georgia, Indiana, Iowa, Kentucky, Maine, Montana, Oklahoma, Alaska, Hawaii and Utah. Please note that this gift is only available for purchase and receipt by persons over 21 years of age. Under a rare circumstance, we reserve the right to substitute product in this gift for products of equal or greater value.